Description: Northbound "Triple Crown" roadrailer heading out of Saginaw Yard at MP 353.8 on the BSNF Fort Worth Sub. My apologies for the grainy effect of the picture as it was taken at about 8:26 PM using 400 ISO. Description: The shuttle train begins its' climb out of New Ulm. The elevator the shuttle was loaded at is in the background. Description: Trailing a sthe last DPU on a stacker. Description: BNSF Roosevelt, WA to Everett, WA garbage train U-ROOEVE1-17A passes the signals at Boeing on the BNSF Seattle Subdivision. Mount Rainier looms overhead. 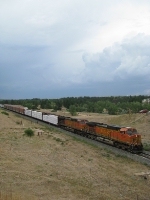 BNSF 4786, BNSF 4585, BNSF 4800, 69 loads (27 lines), 0 empties, 2489 tons, 5181 feet with power, ETD BNQ 43175. Description: BNSF Roosevelt, WA to Everett, WA garbage train U-ROOEVE1-17A passes through Boeing on the BNSF Seattle Subdivision. BNSF 4786, BNSF 4585, BNSF 4800, 69 loads (27 lines), 0 empties, 2489 tons, 5181 feet with power, ETD BNQ 43175. Description: BNSF Roosevelt, WA to Everett, WA garbage train U-ROOEVE1-17A - BNSF 4786, BNSF 4585, BNSF 4800, 69 loads (27 lines), 0 empties, 2489 tons, 5181 feet with power, ETD BNQ 43175 passes BNSF Pasco, WA to Vancouver BC (CN Thornton Yard) manifest train M-PASVBT1-17A which is tied down at Georgetown on the BNSF Seattle Subdivision - BNSF 4433, CN 5724, 25 loads, 72 empties, 5730 tons, 5955 feet with power, ETD BNQ 25867. Description: Rear end DPU's on a westbound coil steel train roll by KY street. Description: Train 22, 3:04pm. 5 1/2 hours late!